What Is “Device Association Framework Provider Host” and Why Is It Running on My PC? If you browse through your Task Manager in Windows 8 or 10, you’ll probably see several instances of a process named “Device Association Framework Provider Host” running. If you’ve ever wondered what it was, why there are so many, and why it might be spiking your CPU usage, we’ve got the answer for you. Device Association Framework Provider Host is an official Microsoft core process that runs under the LOCAL SERVICE account. The process serves as a framework for connecting and pairing both wired and wireless devices with Windows. A separate Device Association Framework Provider Host process will show up in Task Manager for each such connected device. Why Is It Eating Up So Much of My CPU? When it’s working normally, Device Association Framework Provider Host should be pretty light in its use of system resources. You’ll typically see near zero percent in CPU usage, and less than 10 MB in memory usage. 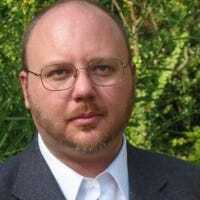 If you see an instance of Device Association Framework Provider Host that is consuming high resources–typically spiking your CPU to above 70%, or using more memory–it usually means there is a problem with the associated device rather than the process itself. Unfortunately, Task Manager doesn’t provide a way to tell which device is associated with which instance of Device Association Framework Provider Host. Instead, you’ll have to go through a few troubleshooting steps. First, update your PC. Let Windows Update do its thing so you can be sure you have all the latest Windows and driver updates–at least for drivers Windows is managing. While you’re at it, you’ll need to make sure drivers that Windows Update doesn’t manage are also up to date. You can find instructions for doing both of these things in this guide. After your PC is updated, fire up Device Manager and see if there are any unknown devices Windows has not been able to identify. It’s possible that you can get Windows to find drivers for the device. If Windows can’t locate them, you may need to find drivers for those unknown devices yourself. No, you can’t disable the Device Association Framework Provider Host service. And you wouldn’t want to anyway. Without it, most device connections to your PC would not be possible. 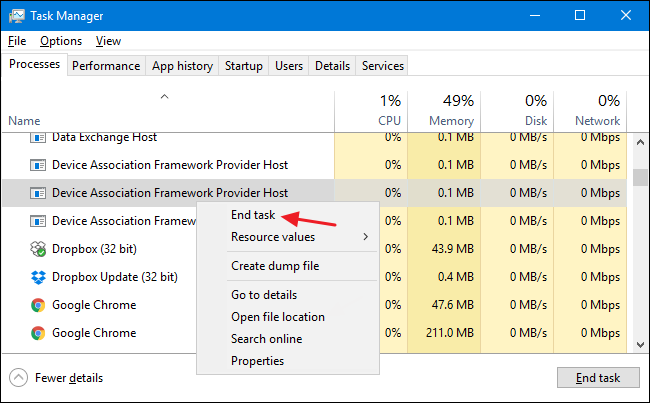 If you do think the service is misbehaving–and you’ve tried troubleshooting hardware driver problems–you can try temporarily killing the Device Association Framework Provider Host task that’s eating up resources by right-clicking it in Task Manager and then choosing End Task. After you end the task, it’s possible that whatever device Device Association Framework Provider Host was managing will stop working. Go ahead and restart your computer. All the Device Association Framework Provider Host processes will reload and you can see if the problem returns. The process itself is an official Windows component. While it’s possible that a virus has replaced the real Device Association Framework Provider Host with an executable of its own, it’s very unlikely. If you’d like to be sure, you can check out Device Association Framework Provider Host’s underlying file location. 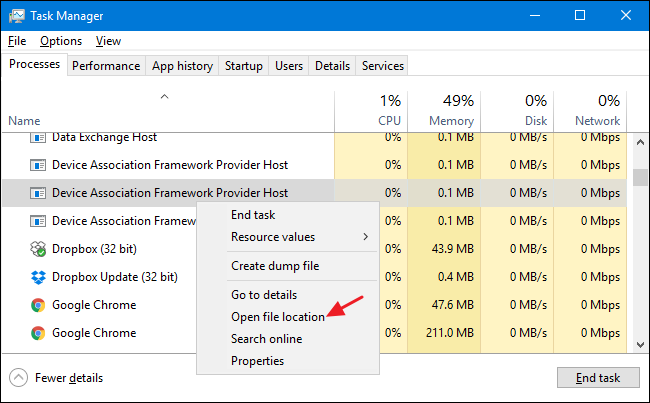 In Task Manager, right-click Device Association Framework Provider Host and choose the “Open File Location” option. The file behind Device Association Framework Provider Host is named “dasHost.exe.” If that file is stored in your Windows\System32 folder, then you can be fairly certain you are not dealing with a virus.